There are a myriad of reasons why this coastal fort is distinctive among its contemporaries, not the least of which is the fort's location. Literally stationed at the entrance of Charleston Harbor, and surrounded by water in all directions, the Fort Sumter National Monument is one of the only East Coast forts that can only be accessed by a boat or ferry, and yet despite its locale in the heat of the shifting harbor waters, is also one of the region's best maintained and intact historic Civil War structures. Originally named after a Revolutionary War Hero, Virginian General Thomas Sumter, Fort Sumter was built shortly after the end of the War of 1812 as a response to an evident need of protecting the southern United States coastline. Constructed to hold 650 men and 135 guns in three tiers of weapon encampments, the solid brick structure was deemed almost indestructible, with walls that were five feet thick, and which provided a five-sided barrier for the interior of the fort. Ironically enough, the fort would see little use after its initial construction, and would only be tested with the first stirrings of the American Civil War. Just six days after South Carolina declared its succession from the country, Major Robert Anderson abandoned the neighboring Fort Moultaire, and quietly re-stationed his Union troops at Fort Sumter on December 26, 1860. This was done without orders from the shot callers in Washington, and with a limited band of 127 men, which included 13 company musicians. The Confederate troops and leaders, after noticing the new occupancy, subsequently called for an evacuation of the fort by the Union troops - a demand which was repeatedly ignored.Tensions rose over the situation, and eventually, Citadel cadets brought the conflict to a head when they fired upon the Union-occupied fort. These shots, which were fired at 4:30 a.m. on April 12, 1861, were thereafter known worldwide as the "first shots of the Civil War," and the pivotal launching point to the years of bloody battles and conflicts which would follow. After the short but brutal battle, the fort was then overtaken and manned with Confederate troops. Fort Sumter would effectively stay in southern hands for the next several years, as troops stationed at the site successfully thwarted an attack by Union troops on April 7, 1863, where 154 Union rounds were fired, compared to the stationed Confederates' 2,209 rounds at the attacking ships. The fort had suffered severe damage after the initial 1861 attack, but southern troops were making continuous, non-stop efforts to strengthen the structure and add even more guns and cannons to the important, Charleston-bordering structure. Several more attacks were planned and poorly orchestrated on the fort, and despite the fact that the town of Charleston eventually fell to northern forces, the water-locked fort technically never lost a battle while in Confederate control. Despite numerous water attacks, the fort never fell due to a fight, but instead was abandoned and surrendered during the Charleston Evacuation, which was spurred by General William T. Sherman's march through the south. The southern troops effectively left the fort on February 17, 1865, and the Federal government took control on February 22nd with a formal flag raising ceremony. After the war, years of battle over this coveted Charleston fort had taken their toll, and Fort Sumter was effectively in ruins. In the latter portion of the 19th century, the fort was used only as an unmanned lighthouse station, and it wasn't until years later that the fort was declared a national monument, (and listed on the National Register of Historic Places in 1966), and was effectively restored and open to the public as a priceless relic of America's Great War. 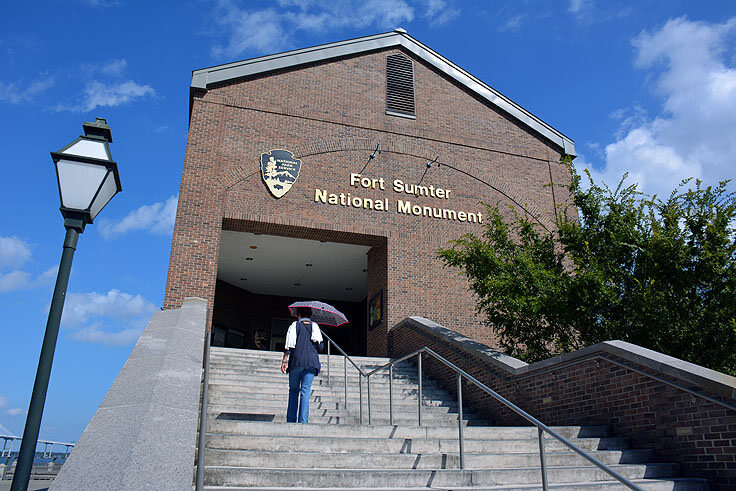 Today, visitors must access the site by boat, generally via Fort Sumter Tours, which is the authorized tour provider and ferry service commissioned by the National Park Service. Tours to the site generally run 3-4 times per day, depending on the season, leaving from both Patriots Point in Mt. 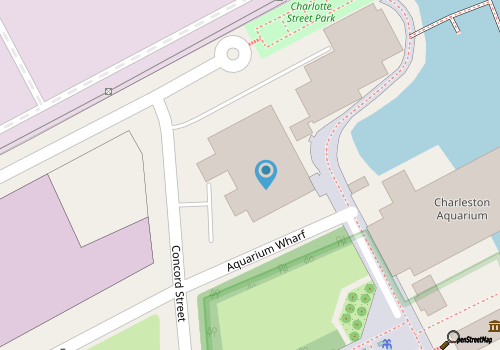 Pleasant, and the South Carolina Aquarium in Charleston at Liberty Square. 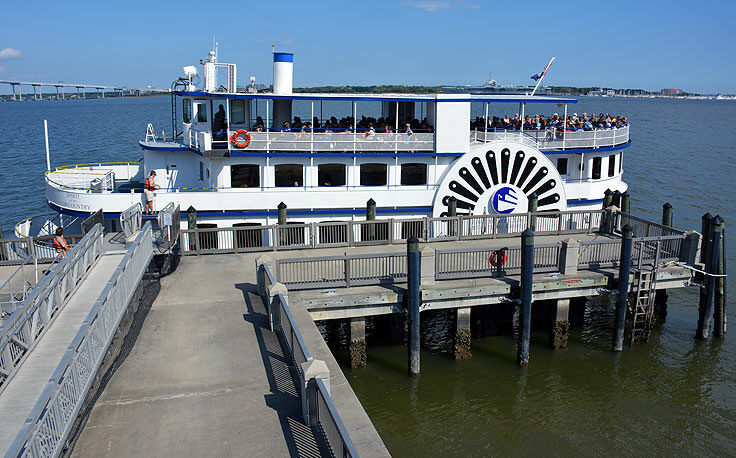 A complete list of tour times are available online at http://www.nps.gov/fosu/planyourvisit/fortsumtertickets.htm, and visitors can reserve their tour tickets online, well in advance of their planned visit, at https://webrez.spiritlinecruises.com/scripts/webret.dll?greet=FSOPEN!group=b. 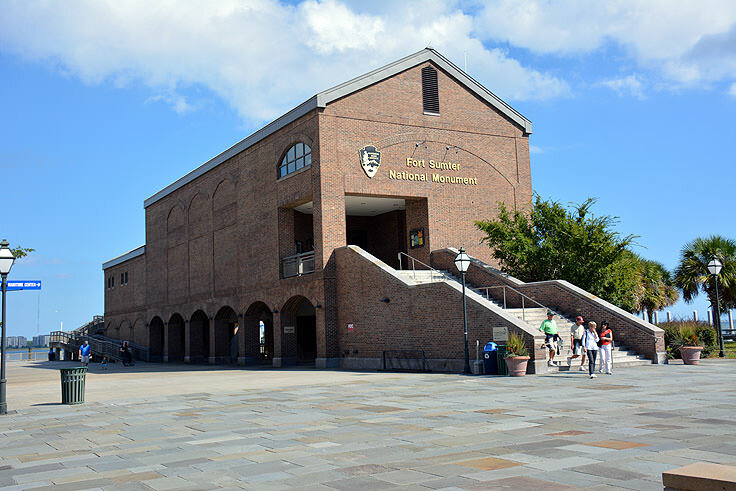 The Liberty Square departure point features the Fort Sumter Visitor Education Center, which offers a wealth of information and displays on this fort's unique role in history. 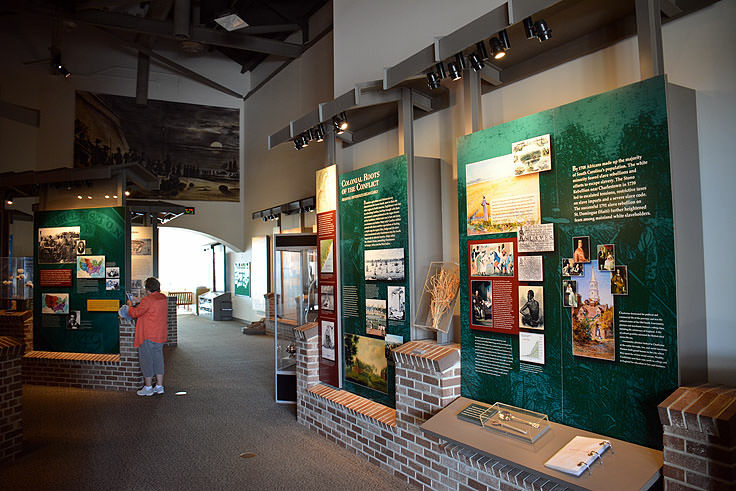 The Education Center is open daily from 8:30 a.m. until 5:00 p.m., while Fort Sumter itself features seasonally changing hours, which generally coincide with the tour departure times. Once on the ferry, it's a 30 minute or so narrated ride to the fort itself, where visitors will be greeted by National Park Service rangers who will expand on the unique history of the fort. 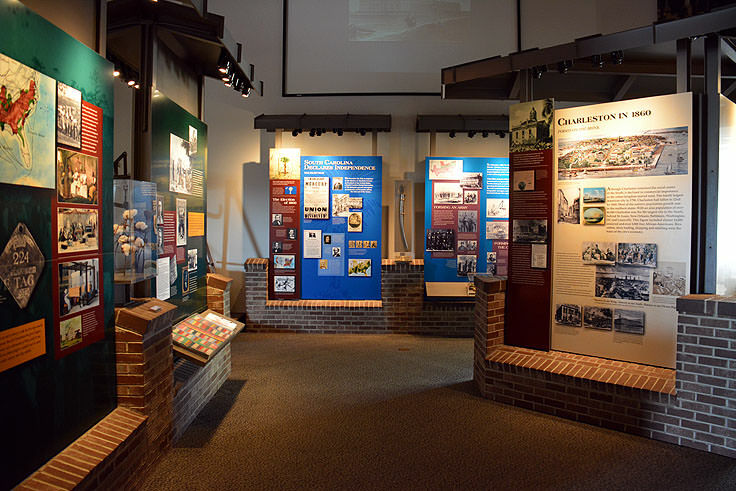 While on site, visitors can explore the restored brick wall perimeter, the stationed guns and cannons, the claustrophobic living quarters and storage areas, as well as the site's famous museum and local gift shop. This is all in addition to the incredible views, which span miles across the harbor all the way to Charleston, Mt. Pleasant, and even the outlaying barrier islands. Fort Sumter is easily one of the most unique sites in Charleston, both for its historic legacy, and its one-of-a-kind locale situated at the water-locked entrance of Charleston Harbor. 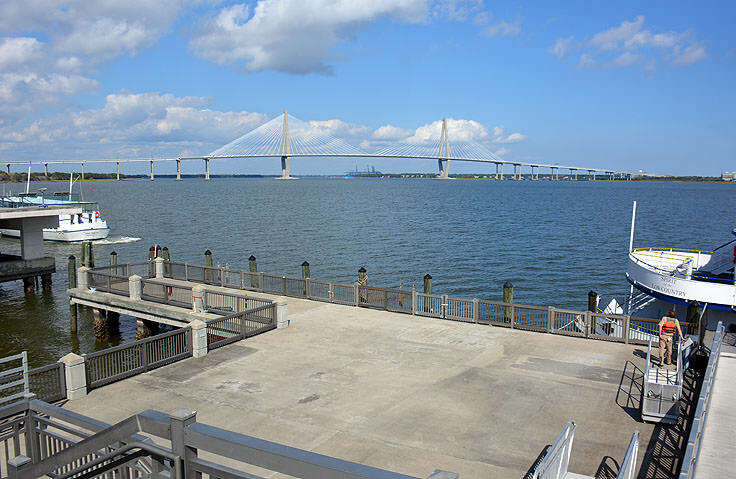 A remarkable exploration for history lovers, Civil War buffs, and anyone who wants a new perspective of the Charleston cityscape, Fort Sumter reigns supreme as one of the most significant and legendary sites within this world renowned historic city.